An unforgettable vacation with your special someone can be a great way to strengthen your bond and bring you two closer together. When considering romantic travel destinations, you can’t go wrong with Niagara Falls. Boasting an impressive assortment of fun couples’ activities, it’s the perfect place for couples looking to reconnect and have a blast in the process. Couples with a taste for fine wine will jump at the chance to tour one of Niagara Falls’ famous wineries. Lovers of upscale tipples are sure to enjoy the high-quality products made at Diamond Estates. This successful winery utilizes ingredients from the best vineyards in Niagara to produce a tasty assortment of reds, whites and fruit wines. If you’ve ever considered making your own wine, a trip to the Niagara College Teaching Winery is in order. In addition to offering guided tours, this establishment hosts lectures and classes about the art of wine making. After returning home, you and your sweetie can put the knowledge you acquire to good use. Most wineries and vineyards are open year-round. No matter when you visit, you’ll be able to enjoy a guided tour and indulge in some delectable free samples. Not only are winery tours affordable and easy to arrange, special discounts for certain tours can be found at prominent Niagara Falls travel sites. Couples who want to enjoy a phenomenal view of Niagara Falls in a relaxed atmosphere should take a ride on the Niagara Sky Wheel. This super-sized Ferris wheel features 42 roomy passenger cars, each of which gives you plenty of space to cuddle up with your special someone. Adding to their comfort, the Sky Wheel’s passenger cars are climate-controlled, making them the perfect shelter from devastating winter cold and sweltering summer heat. Upon reaching the top of the Sky Wheel, you’ll be treated to a spectacular view of the falls and surrounding forestland. Summertime travelers will find that the Sky Wheel is also a great place to view the area’s magnificent fireworks shows. The Sky Wheel’s convenient hours of operation make it accessible to even the busiest couples. Open from 9:00 a.m. to 1:00 a.m. every day, it’s a fitting spot for couples to start or end their day at the Falls. If you and your sweetie have a shared appreciation for natural beauty, don’t hesitate to visit the Niagara Botanical Gardens. Boasting 99 acres of beautiful flowers, enormous trees and other lush plant life, the Niagara Botanical Gardens are sure to delight couples with an interest in horticulture. As evidenced by its world-famous butterfly conservatory, plants aren’t the park’s only sight to see. Frugal couples will be pleased to learn that admission to the gardens is absolutely free — minus parking. In addition to being an effective way to avoid overcrowded tour groups, taking a seasonal horse and carriage tour of the park serves to create an old-fashioned romantic atmosphere. By extension, couples who will soon be tying the knot should consider taking advantage of one of the park’s affordable wedding packages. With the area’s impressive assortment of fine dining establishments, couples will have no trouble sitting down to a romantic meal in Niagara Falls. As an added bonus, many of these restaurants offer patrons breathtaking views of the Falls. If you’re in the mood for masterfully-prepared steak or seafood, make reservations at celebrity chef Massimo Capra’s Rainbow Room. Couples who can never say no to a good pizza will love the world-class Italian cuisine at Ponte Vecchio. Travelers eager to sample dishes that utilize Niagara-native ingredients should head over to Niagara Falls mainstay Strada West. Couples seeking relief from the stressors of the working world should book a stay at the Sterling Inn and Spa. In addition to offering guests a soothing array of couples’ massages, the hotel specializes in revitalizing hot stone treatments. As the Sterling Inn’s spa menu states, expectant mothers can find relief from the aches and pains associated with pregnancy by taking advantage of a relaxing pregnancy massage. Wintertime visitors can combat dry cold-weather skin with the hotel’s transformative facial treatments and seaweed wraps. Additionally, dessert lovers won’t be able to pass up a tantalizing chocolate-covered strawberry wrap. 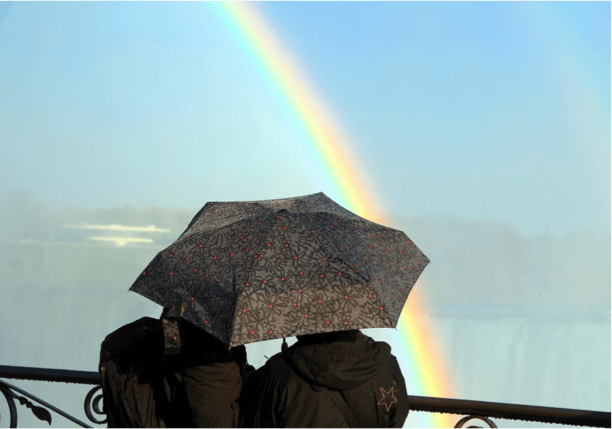 Couples visiting Niagara Falls will never have to worry about boredom or dissatisfaction. With so many enjoyable activities to choose from, your only problem will be finding the time to experience them all.